"I say it is the most beautiful show on Earth, the most colorful show on Earth and the most unique show on Earth." Such are the words the late Jeff McKissack used to describe his Orange Show, a highly unusual and perplexing monument to what he believed to be the world's most perfect food. 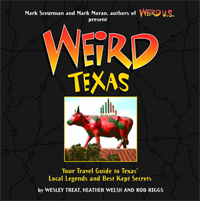 Starting with what he had previously built as a plant nursery, McKissack began constructing the attraction across the street from his Houston home in 1968. He gave a variety of reasons for starting the project, which included his continuing failure to build the perfect orange juicer, as well as the inspiration he gained from a handshake he once shared with inventor Thomas Edison––who, incidentally, hailed from West Orange (NJ). The result is a visual hurly-burly of mosaics, spoked wheels and whirligigs. Signs proclaiming "Go Orange, Be Strong" and "Be Smart, Drink Fresh Orange Juice" adorn the walls. Passages lead to multiple spaces and levels, partitioned by multicolored railings and connected by sometimes treacherous stairways. Though the assemblage takes up only 3,000 square feet, it's easy to get disoriented. It's all so mesmerizing, however, it's hard not to be amused. A multitude of puzzling displays fills the Orange Show, made up of seemingly random objects McKissack acquired over the years. A scarecrow, a butter churn, a steam engine, a mannequin in a bridal gown––no matter how arbitrary it seemed, he always found some way to link it back to oranges. Facing the various display areas are nearly a hundred painted tractor seats, many of which make up a mezzanine overlooking what's known as "the pond." Here is where McKissack built a mock steamboat with which he planned a stage show. Battery-operated animals were to ride the boat and put on some sort of unexplained performance. McKissack insisted people wouldn't know if the animals were real or not, though it's difficult to tell whether he was being facetious or if he were just a bit delusional. 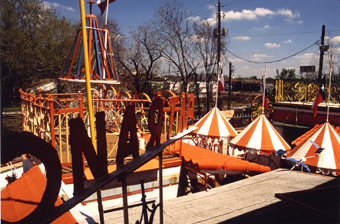 When he finally opened the attraction in 1979, McKissack believed his orange-themed opus would draw four out of every five Americans, becoming more popular than Disneyland or the Grand Canyon. The crowds didn't come, though, and the hopeful visionary passed away only eight months later. Some believe he died of a broken heart. But he would be happy to learn that the Orange Show was purchased soon thereafter and has been preserved almost exactly as he built it. Plus, the effort spawned the Orange Show Center for Visionary Art, an organization that promotes and maintains similar projects throughout Houston. 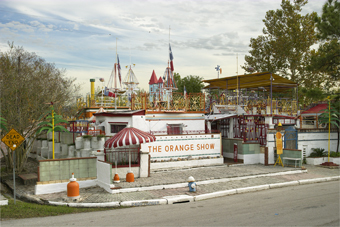 The foundation has been so successful, in fact, it's brought more than half a million visitors to the Orange Show since its creator's death. Perhaps he'll get his message out after all.